BUCHAREST BIENNALE 7 ‘What are we building down there?’ curated by Niels Van Tomme will take place from May 26 to June 30, 2016. The final date to send your requests is May 17, 2016. Please note that due to high demand, only journalists and professionals in art and culture are eligible to register for the preview. You can also pick-up your accreditation, opening party invitations and the press file. 21 locations across the city. 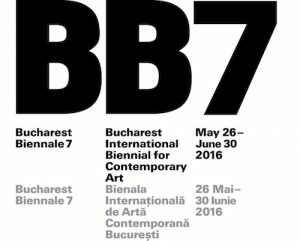 A debate on the topic of the Bucharest Biennale 7 with Niels Van Tomme, Charlotte Van Buylaere and the participating artists. 16.00 Participating artists of BB7 Allard van Hoorn (NL) and Rie Nakajima (JP) will present a performance. The BB7 Info Point is located in A3 Bar (2 Arthur Verona St.). All information on the locations, the artists and side programs will be available on our website and at the BB7 Info Point. This venue also serves drinks and meals.